Yesterday Brian decided he wanted a balloon animal. 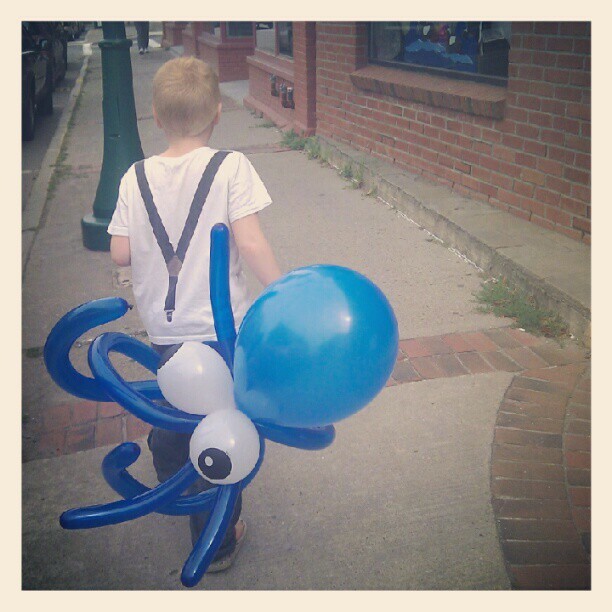 We were at an event raising money for our local Humane Society when he became fascinated with the balloon artist. The artist had several different examples of things he could make hanging from his tent. I asked Brian which one he would like and he promptly pointed to the green octopus and answered, “Octopus”. The balloon artist asked him what color he wanted. He pondered for a second and answered, “Blue”. It wasn’t necessarily the word itself as he has been able to label colors for a long time. It was the combination of the fact that he answered a stranger without me having to intervene and that he really thought about it and didn’t just say the color of the octopus that was on display. I just don’t get how everyone around us wasn’t celebrating. And it’s moments like that that you realize how much autism exemplifies those little moments. And how much more one can appreciate the little things when autism has been such an integral part of your life.